It’s difficult for most Americans to know where to start when reviewing their household budget. It can seem like a daunting task when every last penny seems to be going to bills, groceries, and other expenses. But it can help to review some of your smaller expenses to see where the money goes. Mornings are when many of us waste the most money. For instance, over half of all Americans drink coffee in the morning. Buying your coffee at the Starbucks or Dunkin Donuts on the corner for an average price of $2.50/cup can really add up. The monthly cost can be as high as $77.50! You can purchase a single cup brewer such as the Hamilton Beach single scoop brewer which will pay for itself within one month. Almost 20% of all Americans also smoke. Mornings are often when smokers pick up a pack of cigarettes. If you can’t kick the habit for health reasons, consider the impact on your wallet. The average pack of cigarettes costs $8. That’s $248/month for the typical pack-a-day smoker. That’s money that could be going towards a car payment! Finally, take a look at your morning commute and get inspired from the Europeans. Driving yourself may be the most expensive way to get to work in time, gas, and wear and tear on your vehicle. If you live close to work, consider riding your bike. Go green and save money at the same time! If biking to work is not practical for you, check out public transportation. Bus and rail lines are often much cheaper than driving and offer a great way to relax and escape the stress and hassle of commuting. Most of us are not willing to give up our date nights and periodic meals out and that’s ok, but there are ways to splurge and still be savvy. Instead of spending extra on a babysitter for date night, try to set up arrangements with other parents of young children. Work out date night schedules so that you all get free babysitting and time to yourself! This can be a huge help to parents of young kids. Sign up for deal sites like Living Social and Groupon. These sites often offer deals of 50% off or more on local dining and events. Restaurant.com also offers great deals on restaurant gift certificates – just be sure to read the fine print! Pay off credit cards in full every month to avoid interest fees that can bury you. Use your check register religiously to avoid bank overdrafts that can cost hundreds of dollars in fees. Talk with your bill collectors, such as your insurance agent, to find out what discounts are available if you pay your annual premium in full. While this may be a large amount to come up with at once, it will be one less expense to worry about for the year and you can usually save a large amount in the long run by paying it all at once. 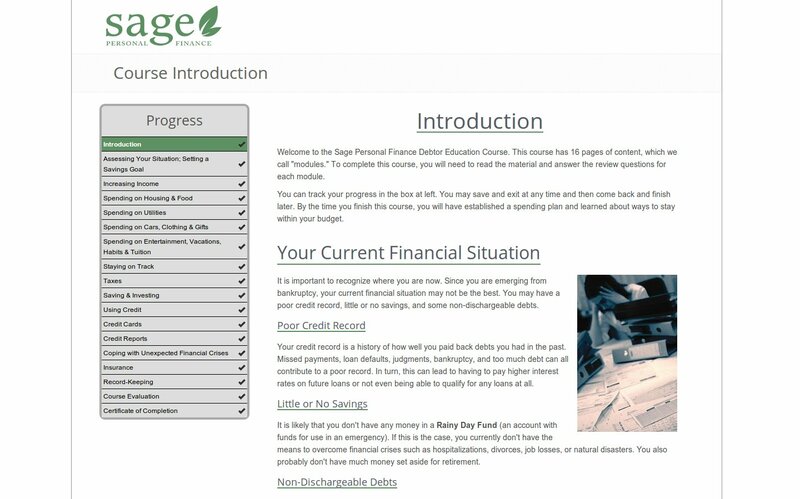 If you’re ready to get back in control of your financial health, visit Sage Personal Finance for the mandated financial management course during bankruptcy filing. While we aren’t professional finance experts, we do know that knowledge is power – and knowing the ins and outs of your credit profile is one of the simplest and most powerful ways to take charge of your financial life. In our course, we let our students know that all consumers are entitled to at least one free credit report annually from the three major credit reporting bureaus (Experian, TransUnion and Equifax) through the Federal Trade Commission’s government website, annualcreditreport.com – but there are several other sites that provide a means to stay on top of your credit profile the other 11 months of the year…and they are 100% free of charge. Quizzle offers a wealth of financial monitoring tools (both free and paid subscription-based) available to curious consumers, including free credit scores and reports twice a year. Quizzle also offers paid subscription services that offer a variety of credit monitoring “add-ons” – but these additional services do cost extra. If you’re simply looking to keep an eye on your credit report a couple of times a year, stick with Quizzle Free. Credit Karma digs a little deeper into a user’s credit history with its “free” plan. In addition to four free reports (with scores) annually, Credit Karma offers a unique “Credit Report Card” — a simple summary of your credit report details and ways to see how different financial decisions impact a consumer’s overall credit profile. It also offers a credit monitoring alert program that notifies users of important changes in his/her credit report as soon as those changes are reported to the credit bureaus. Consumers that enroll receive this very useful tool at no extra charge. Credit Sesame offers a free credit score (and report) every month courtesy of credit reporting agency Experian. As with Credit Karma, Credit Sesame also provides users with real time credit monitoring to alert users to such things as “hard” and “soft” credit inquiries, payment history and credit ratios. On their own, any of these free services can empower consumers, allowing anyone to better understand the world of credit, and what activities can raise or lower a user’s credit profile. Check them out and let us know if any (or all!) of these free services have helped you become a savvier consumer post-bankruptcy!